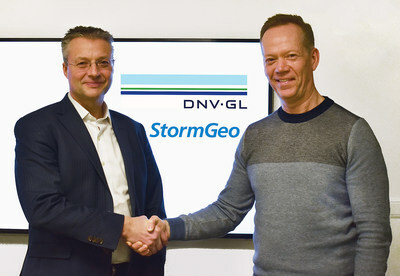 OSLO, Norway, Feb. 7, 2019 /PRNewswire/ -- StormGeo and DNV GL announced today that they have signed an agreement to consolidate their fleet performance solutions under one banner. The agreement will combine DNV GL's ECO Insight and Navigator Insight solutions with StormGeo's FleetDSS and ship reporting solutions. By this a new industry leader in fleet performance management is created as part of StormGeo. "Partnering with DNV GL enables us to accelerate the development of our fleet performance management offering by pooling the competence, software, and insight of both companies," said Per-Olof Schroeder, CEO, StormGeo. "Bringing these solutions together will give our clients even more ways to enhance the safety, efficiency, and transparency of their operations. Finally, it builds on our vision of establishing StormGeo as the leading provider of performance management solutions to the shipping industry." The consolidation creates the largest vessel performance data set and developer team in shipping, providing industry-leading analytics that give customers even better data to enhance their operational decision making. The existing services will be maintained and strengthened within StormGeo, with all solutions brought together in the back-end, utilizing an improved data infrastructure. DNV GL will retain a strong connection to the new solution through the 26.4% share in StormGeo it has held since 2014, as well as continuing technical support to ECO Insight customers. Users will also able to share data through DNV GL's open industry platform Veracity. "Since its introduction in 2014, ECO Insight has grown into the largest performance solution in shipping, with installations on more than 2,000 vessels. In addition, already 22 industry partners connect their data and analytics to the solution," says Trond Hodne, Senior Vice President at DNV GL – Maritime. "ECO Insight has already been an outstanding success, and by combining it with StormGeo's services we believe we can offer our customers a solution that not only gives broader functionality but taps into a richer data set. This will give our customers new and exciting services and insights to boost their competitiveness. We look forward to seeing ECO Insight going on to further success as part of StormGeo." StormGeo is the industry leader in weather intelligence and ship routing services. More than 12,000 ships rely on StormGeo software or services for navigational planning, route optimization, weather and fleet performance. The company has 27 offices in 15 countries, including six 24/7/365 global operations centres offering premium services and support while being in the forefront of innovation. StormGeo is an ISO 9001 certified company and is dedicated to provide the best possible support and quality of service.